Protect It Now with a. 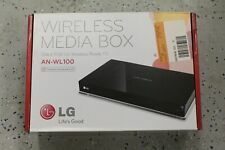 New In Box LG AN-WL100 HD Wireless Digital Media Box. Shipped with USPS Priority Mail. Now you can give your beautiful new LG HDTV more breathing room. 1080p Wireless Transmitter and Wireless Ready Receiver. LG AN-WL100W. Freedom of Wireless Full HD. Full HD 1080p, Uncompressed Video. 13.2W (on), 0.5W (off). LG AN-WL100 Digital Media Streamer / Wireless media box (Latest Model). Condition is New. Shipped with USPS Priority Mail.